If you are used to shop online every other day, than this money saving tips for online shoppers will be game chaining. Here is list of some unknown tricks, tips and money saving things which you can apply at the time of online shopping and you can save more money. There are various point which regular online buyers or first time buyers don’t know, so here some cracking money saving tips for online shopping, hope you like it. 1. Always Use wallet payment methods like Paytm, payumoney etc. These mobile wallet apps do provide upto 30 % discount if you do transactions from these apps. 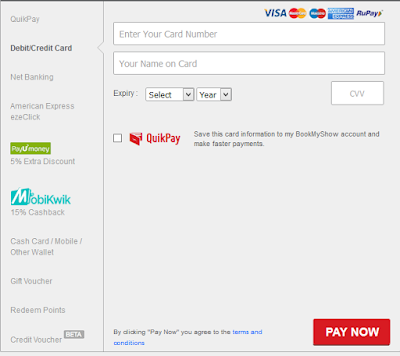 For example, when I recently try to buy movie tickets, Payumoney was offering 10% cash back if we do pay money via payumoney, or sometimes even 20%. As you can see in above screenshot (taken from bookmyshow) where using mobikwik gives 15% cashback while payUmoney gives 5% extra discount. Tip :- if you used to buy movie tickets from bookmyshow, than you can try ICICI Bank’s payment gateway, sometimes they do offer “Buy 1 ticket and get 1 ticket free” offer. There are certain websites which offers features like comparison, i.e mysmartpice[dot]com where you will get list of price comparison of different online sites. You can buy from the list with lowest price tag. Mysmartpice[dot]com also provide price history feature which may also help you to find the best price, and similar product section which will enhance your buying experience. Above is price comparison of iphone 6 price in india from mysmartprice[dot]com. you can try too. 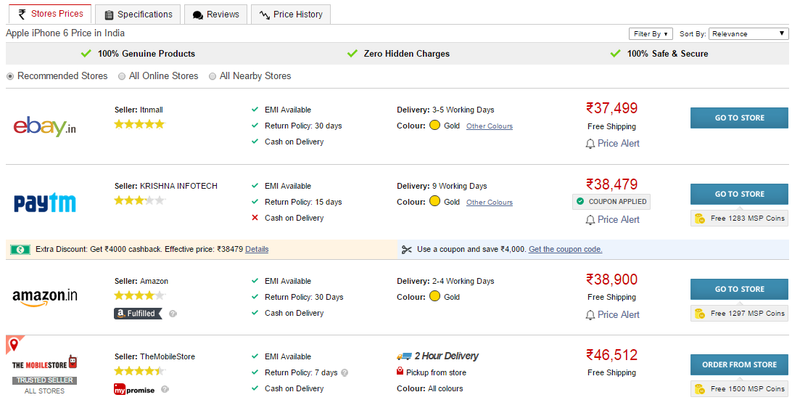 There is chrome extension called “Buyhatke” which provide other website’s price for same product you are browsing for. Just install buyhatke chrome extension in your google chrome browser and you will get price alert at your top of your webpage whenever you browse at shopping site. 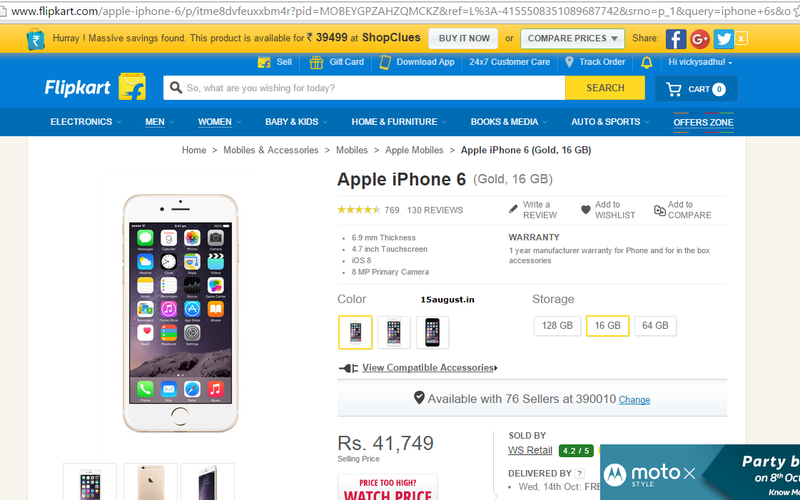 Above is example of Buyhatke extension where I searched for Apple Iphone 6 product at flipkart and at the top it alerts me that same product is available for low price at shopclues website. The price difference between two sites is almost 2 thousand. This thing does save lots of money, isn’t it. Like payment gateways, there are lots of coupons website available which will provide you good discount for the product you are buying. In the eCommerce business coupons do give extra money to buyers as well as sellers. Such coupons defiantly will save almost 10-15% of your total amount. 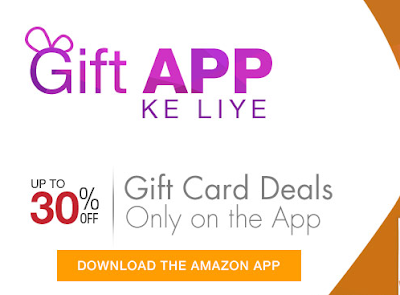 All the major websites like Amazon, Flipkart, Snapdeal and ebay supports coupon feature. You can get coupons for particular product just by google for the “product name+coupon code”. 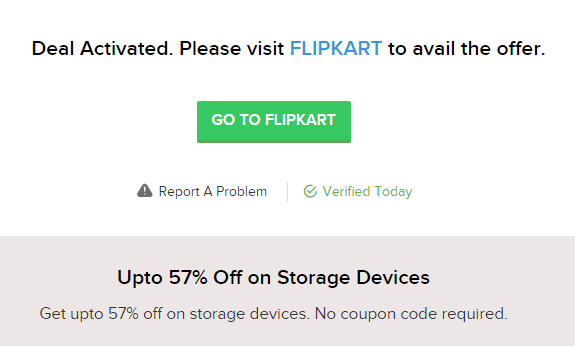 The above coupon gives me up to 57% off on storage device (pen drive and hard disk). 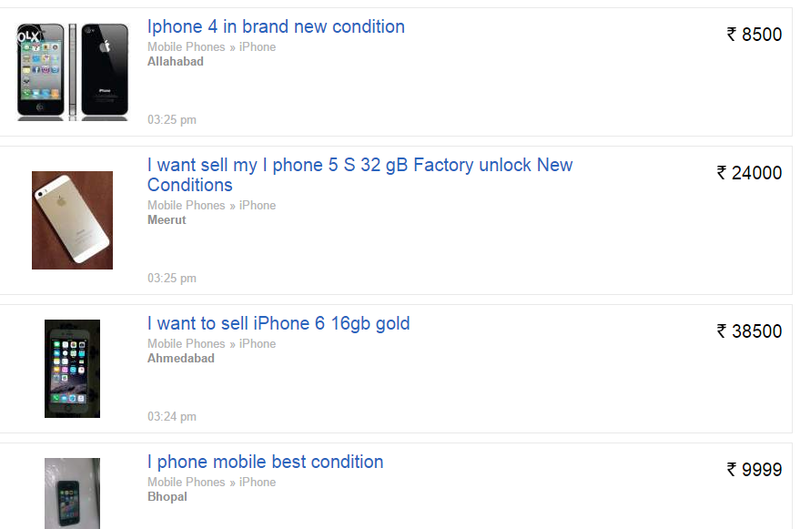 I just googled flipkart coupons and found good deal :). Sometimes bank and online sites or bank and particular brand’s do tie up for some promotional offers and provide extra discount if we buy product via their Credit card or debit card. Such cashback offers are keep running for entire month or year, which you can avail at the time of online shopping. You may even hared that amazon offers 10% cashback via shopping with axis bank card, such offers are keep coming, keep searching for that and save money. Also, we should buy more via Credit card because soon, government to give tax benefits on Credit card/Debit Card transactions. Online Shopping sites also do have wholesale day like we used to have in offline local markets before diwali festival or new year. Same way, Flipkart do have “Big billion day” and Amazon have annual discount day or all sites combined discount day “Great Indian Shopping Festival” (GOSF) on these days, you can get many items at lowest price. Like, last year I bough Air-conditioned at 15% low price than regular price from flipkart at big billion day. You can also try to shop on these days to get more discount. Here we have a tool created by Amit Aggrawal from Labnol by which you can track price list of products from online shopping in a Microsoft excel spreadsheet. If you have plan to buy something in feature and want to buy it at lowest price than these feature will help you to save a lot. Using these feature you can set price alert and you will be notified (via email) for any price change in the product you are interested to buy. You can set price bar that you will buy product at particular price only, so you will be notified when the price is reached. 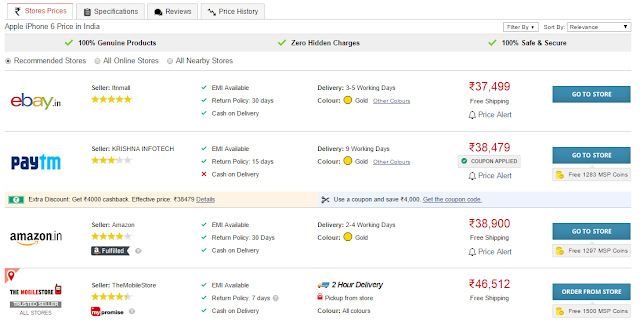 You can also use Cheapass.in for such price alerts or even at Juglee.com we can find similar feature. OLX and Quikr do provide low price list of products with 2nd hand items. OLX and Quikr may give you high discounts on your product. Or sometimes you can find good condition used product which can also save your money. The above screenshot is of OLX.in where i searched for Iphone 6 and it shows me used iphone deals at cheap price. 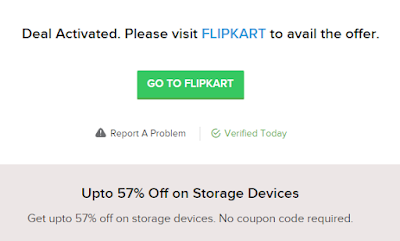 Websites like Flipkart and snapdeal provide extra discount for mobile app users. You can buy product via their mobile app and get more discount on price. This is the most recent trend since online shopping companies wants to market their mobile application and they provide extra discount for mobile app users. The above image is taken from amazon.in where they offer almost 30% extra discount only on mobile App buying. So, try to find such links and buy it via mobile app to get extra more discount. Most of Travel websites (like Makemytrip and cleartrips) provides dynamic price to users based on their browsing history. If you are returning user of their website, you may get higher price for tickets. You can delete your browsing cookies (cntrl+shift+delete) or use Incognito mode (Going incognito doesn’t hide your browsing from your employer, your internet service provider, or the websites you visit.) via pressing cntrl+shift+N. By using this, you may get low price than compared to regular price as using this feature, you will be 1st time visitor for the website. 1st time buyer always get pleased. Yes, This trick worked for most of the people. When the online sites knew that few customers are interested to buy X things, and not bought it after adding in the cart, they may offer you some discount or offers you something which will influence you to buy it now. Shopping cart abandonment is biggest issue faced by eCommerce websites, (which means potential selling which did not happen as customer added it in cart but not bought it). In that case, you may be offered some discount coupons or any other offer to make you buyers. 12. Visit Offer Page before buying. Almost all the eCommerce websites have their own offer page where they list their daily offers (discount offers or ek pe ek free or similar offers) which you should visit before buying anything from eCommerce Website. Will be adding more tips soon, keep visiting, Thank you!